This pair of high quality, circular sterling silver cufflinks feature a replica of the Ancient Greek Drachma Coin* called "The Owls." 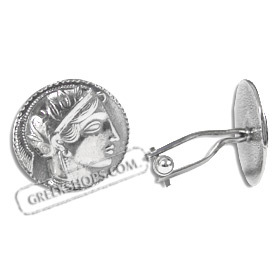 This portrait of the Ancient Greek Goddess Athena is from the front face of the coin. * Athenian Owls were arguably the most influential of all coins, and the Classical Owl tetradrachm is the most widely recognized ancient coin among the general public today. Owls were the first widely used international coin. They popularized the practice of putting a head on the obverse of a coin and a tail (animal) on the reverse. Owls were handled by Pythagoras, Xenophanes, Democritus, Hippocrates, Socrates, Plato, Aristotle, Euclid, Archimedes, and others whose thinking formed the very foundation of Western civilization. They remained thematically unchanged, Athena on the obverse, her owl on the reverse, for half a millennium, through great changes in the ancient world. Because of their centrality, they were known as "Owls" in ancient times as they are today despite many other ancient coins depicting owls in an equally prominant fashion. President Theodore Roosevelt used a Classical Owl as a pocket piece, which inspired him to order the redesign of U.S. coins early last century. In Greek and Roman mythology, Glaucus (Greek: Γλαῦκος, Glaukos, "glaring (eyes)") is the symbolic owl of Athena or Minerva, respectively. Often referred to as the "owl of Athena" or "owl of Minerva", it accompanies Minerva in Roman myths, seen as a symbol of wisdom because the owl is capable of seeing even in the dark and of vigilance because the owl is awake at night. **Rhodium is a precious metal, a member of the platinum family. Rhodium electroplating is used on jewelry in order to provide a surface that will resist scratches and tarnish while giving it a white and reflective appearance.